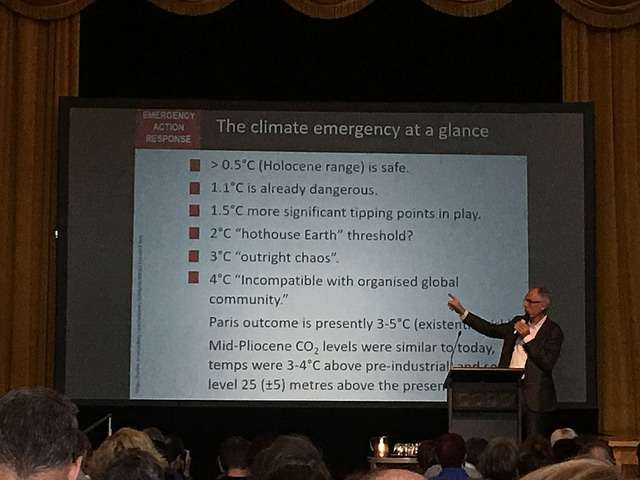 The last two days - 11-12 September - I attended the Darebin climate emergency conference in northern Melbourne suburb of Northcote. I was one of 350 people that registered and attended. Some good speeches and presentations, interesting panel discussions and useful one-on-one conversations. This was Darebin Council hosting and facilitating this conference as part of it's climate emergency strategy and plan. There were a small number of councillors from other cities present including the Deputy Mayor of neighbouring municipality of Moreland, and other organisations. But mostly local people and people from neighbouring suburbs. I saw Lidia Thorpe, the local Greens State MP there, but no other state or federal politicians. Objective 2: Build understanding of the climate emergency and possible responses to this. And after the final plenary I played a small part that evening in asking a question on the Climate Emergency motion moved by Cr Dale Martin at the Moreland Council meeting. After some debate Moreland Council passed the resolution unanimously acknowledging we are in a state of climate emergency and starting a framework for implementing this decision. It is Important to build and campaign from the grassroots, not be afraid of bold messaging, because we are rapidly running out of time to have agency. The last couple of years I have attended council meetings in the public gallery, asked occasional questions, and built up a rapport with Councillors to varying extents. My presence provides witness to all decisions needing to take into account possible climate mitigation and adaptation impacts. I encourage others to attend Council meetings, engage with Councillors on issues related to climate mitigation and adaptation. Because we are dealing with concrete impacts, and concrete solutions you can often find common ground no matter the ideological background. It's all about having the conversations about public safety and duty of care. As an activist through her work as a Pacific Climate Warrior, Jacynta uses her voice to elevate stories from frontline communities impacted by climate change. We can learn from existing communities that are active in the climate movement. The lessons we can take from frontline communities (diaspora communities) not only add value but also send a powerful message of solidarity and unity, thus empowering culturally diverse communities. It is not an easy task to mobilise a community to support a cause without investing quality time in forming relationships in them; this builds trust which is valuable. In this presentation Jacynta will share some stories and reflect upon ways we can work in solidarity across organisations in our networks to demonstrate climate leadership. Climate change is already dangerous, and the projected warming in the wake of the Paris Agreement in 2015 poses a threat to human civilisation unless the pace and scale of action to decarbonise society and return to a safe climate is radically increased. This presentation looks at recent observations, projected warming and impacts on key features of the climate system, and analyses how the understatement of climate risks has become incorporated in the communication of scientific research and in policymaking. Parameters for returning to a safe climate are elaborated on. If climate change poses an existential risk to society, what does it mean to have an emergency response, technologically and politically? How should we act? In this presentation Philip Sutton explores what it will take to deliver maximum protection of the climate vulnerable and the restoration of a safe climate. He sketches an action framework to cool the planet fast, via zero emissions and carbon dioxide drawdown, through emergency mode action by government, businesses and the community, and building on key historical case studies of large-scale, rapid restructuring of economies. Climate emergency action vs climate change action: what is the difference? guiding principles and lessons learned which can be applied to the climate emergency. Australia’s superannuation funds are now responsible for more than $2.6 trillion, with which they invest in companies across the country and the world. Through activist shareholdings, Australian Centre for Corporate Responsibility seeks to make super funds accountable for ensuring a safe climate future, by amplifying their influence over listed companies. In this presentation Brynn will explore strategies for responsible businesses as well as opportunities for shareholders to use their power to ask companies to improve their performance on issues you care about including climate emergency. 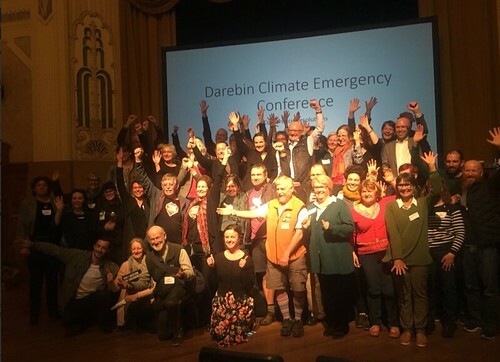 Climate Emergency Darebin: who, what, why and how? This presentation will focus on insights and results from research undertaken for Darebin City Council’s Climate Emergency / Communication and Engagement Solutions project, using evidence based story structure. Tips on how to apply the research in practice will also be covered. There is a growing body of evidence on the range of emotional impacts of climate change; both from people affected by extreme weather events, and those coming to grips with the scale and complexity. Yet while people will generally agree climate change is happening, there is a reluctance to wholeheartedly accept the difficult news of the scale and urgency of action required. This talk will share three common challenging emotional experiences. A model will be shared to understand the emotional systems activated. The word ‘emergency’ will be explored through reflecting on our personal experiences, to consider the meaning and inform application. Earth Systems has been engaged with Manningham City Council for the past 2.5 years diverting their internal parks and gardens tree prunings and green waste from landfill and converting it to a carbon sequestring product called biochar. Biochar is a true form of carbon sequestration, locking up the carbon of the original tree for 1000 years plus in a stable carbon form. Normally biochar is used for soil applications adding carbon to poorly performing soils to improve their performance with increased surface area, water holding capacity, nutrient holding capacity and other benefits. In this presentation Adrian will share the biochar development story including the research which highlights the carbon sequestration capacity of biochar, the EPA approval process, the working relationship with Manningham Council and lessons learned along the way. needs to respond have more effective conversations with those around us to get them on board too? Climate for Change has facilitated conversations in the communities of Melbourne and now Brisbane with over 5000 people. In this presentation Katerina Gaita will share her experience as a climate communicator, reflecting on what has been learned and the social research that informs the Climate for Change approach. The Green Impact program is a change and engagement program piloted for the first time in Australasia at The University of Melbourne in 2017. Learn how UoM has implemented a program that gets staff and students working together to create the change they want in their departments. Teams can focus on their strengths and change their workplace from within. The program is about ensuring sustainability is fun and inclusive. In reflecting on the Green Impact program Sue will share strategies, tips and innovative ways to raise awareness about sustainability, and collaborate, to deliver real change within complex organisations. As the Earth moves further into the Anthropocene and ongoing destabilisation of seven of its eight regulating systems, constructive solutions seem hard to find in the face of an ongoing commitment by business and political leaders to economic rationalism. However, emerging out of the pack is one field of collective endeavour providing some exciting solutions to these Anthropocene problems: that of regenerative agriculture. By healing key landscape functions, there is now powerful evidence (supported, for example, by Hawken’s book ‘Drawdown’) that collective regenerative agriculture can drawdown carbon from the atmosphere by more than a factor of two compared to the next best method. In this talk Charles will explain the background to this exciting potential and to possible future pathways.